The SeaHawk LD1000 single zone leak and water detection controller monitors up to 1,000 feet (305 meters) of sensing cable. It is compatible with all SeaHawk sensing cables and SeaHawk SD-Z and SD-Z1 spot detectors. As a stand-alone leak detection controller, the LD1000 features an audible alarm and three LED indicators. It is ideal for small areas, facilities where the sensing cable or spot detector is exposed or leaks can be easily located, and areas where the audible/visible alarm can be easily noticed. And as of March 1, 2019, all LD1000 units are Modbus enabled, so you can integrate them via Modbus output into existing monitoring systems. Note: The LD1000 requires an isolated power supply. 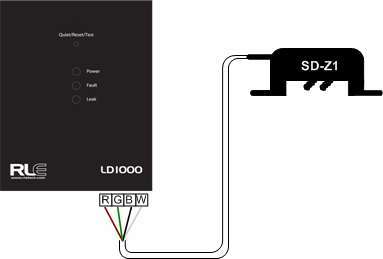 A power supply is not included with the LD1000. Purchase either RLE power supply PSWA-DC-24-ST or WA-AC-24-ST. Detection Response Time: Configurable for 10sec or 2min, ±10%, when used with conductive fluid or chemical sensing cables.